They also note that prices of landed properties have fallen to attractive levels from their peak in the third quarter of 2013 to the second quarter this year. This unleashed pent-up demand, with the strong buying activity leading to prices beginning to firm in the third quarter. The number of landed homes sold between January and October reached 1,513 units, up 50 per cent from the 1,009 units sold in the year-ago period. Savills Singapore's analysis of caveats data from the Urban Redevelopment Authority's (URA) Realis data downloaded last Tuesday showed the value of transactions climbed 41.1 per cent to $6.1 billion from $4.3 billion. The preliminary numbers for the first 10 months of this year have already surpassed last year's full-year showing of 1,187 units, sold at $5.1 billion. The final transaction figures for January to October can be expected to be higher, as more caveats for last month surface over the next few weeks. Mr Tay Kah Poh, executive director of residential sales and leasing at Knight Frank Singapore, said: "To some extent, buyers seem to have returned to the market with a vengeance, with sentiment buoyed by all the positive news about overall sales volume, record land prices, the influx of en bloc millionaires seeking replacement homes and improvements in the economy." Savills Singapore research head Alan Cheong said: "Demand for landed properties here is partly aspirational. Owning a landed home is probably still ranked high in the hierarchy of housing wants among Singaporeans, as (such homes) are relatively scarce." Realstar Premier Group founder William Wong added that those who have been waiting for the past two years are now entering the market, ready to buy. Mr Cheong highlighted that landed homes posted a bigger price decline than private apartments and condominiums over 15 quarters, before prices turned up in the third quarter. This narrowed the price differential between the two categories, thus improving the attractiveness of landed homes. 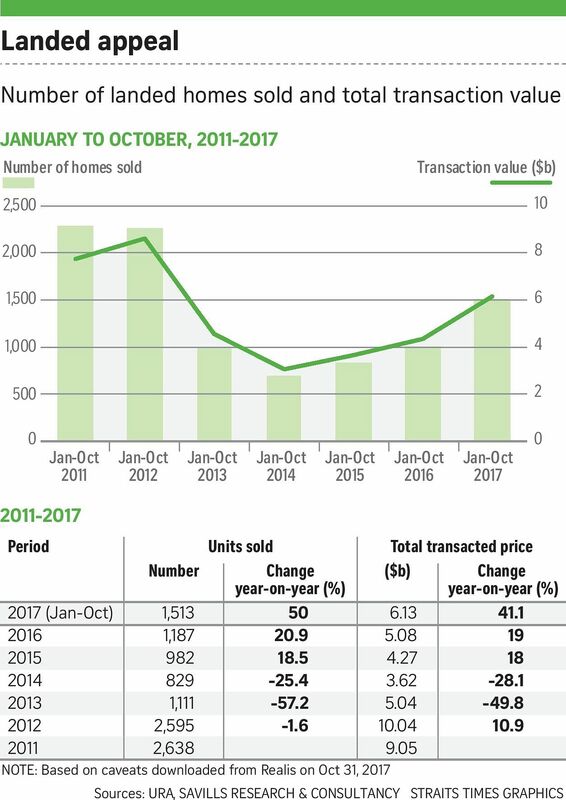 Between 2013's fourth quarter and this year's second quarter, the URA's price index for landed homes contracted 16 per cent. Its non-landed private home price index fell 10.2 per cent. The strong buying activity is starting to have an impact on prices, as seen in the 1.2 per cent quarter-on-quarter rise in the price index for landed homes in the third quarter, which surpassed the 0.6 per cent gain in the non-landed index. Mr Cheong noted that although the top 20 per cent of Singapore households had lower income growth between 2011 and last year than other household categories, these more well-off households still had an increase in income. He said: "Coupled with the sharper price declines for landed properties, it has meant that despite having the TDSR (total debt servicing ratio) framework in place, landed homes had become more affordable to the top echelons of society here." Prices should continue to rise by another 5 to 7 per cent by end-2018 for landed homes across all sectors. REALSTAR PREMIER GROUP FOUNDER WILLIAM WONG, who noted that landed property prices had stabilised in July and August, and inched up 2 to 3 per cent in September and October. Mr Wong said: "Most have found that with the market bottoming, the only way forward is for prices to pick up again." He said landed property prices stabilised in July and August, and inched up 2 to 3 per cent in September and October. "Prices should continue to rise by another 5 to 7 per cent by end-2018 for landed homes across all sectors," he predicted. "Some sellers have already adjusted prices upwards." In its analysis, Savills included caveats data for bungalows, semi-detached and terraced houses transacted in primary and secondary markets, but excluded collective sales of such properties. Also excluded were strata landed homes, which are low-rise landed residential properties that are akin to condos in that they do not come with land titles but are instead strata-titled. They may also have shared facilities.